how we might be able to help you. With the occupation of the oil export ports of Ras Lanuf and Es Sidre, Field Marshall Haftar has taken control of Libya's oil crescent, and with it effective control of most of Libya's oil resources (see map to the left).This places the western backed Government of National Accord, the so called national unity government, at a significant disadvantage in the real life "Game of Thrones" currently playing out in Libya. The key question is whether the militias in western Libya, which back the GNA, will accept Hafar's fait accompli? We do not believe they will for three reasons. Firstly, acceptance of Haftar's control of the installations also means ceding political control of Libya to Haftar and the politicians in the eastern half of the country. Avoidance of this outcome was the reason the country bifurcated in the first place, so it is unlikely that it will be accepted now. Secondly, the western militias are in the end stages of the fight for Sirte. This battle has been hard fought with the militias suffering many casualties. The militia leaders believe these sacrifices have earned the western part of the country a big, if not the biggest, role in the post-conflict government. The current reality on the ground in the oil crescent makes this outcome unlikely, so they will seek to change the situation on the ground to their advantage. Thirdly, Haftar was at one point a serving army officer under Muammar Gaddafi. Therefore, the western politicians and militias do not trust him to honor any type of political accommodation that might be agreed upon between eastern and western politicians. Libya is a member of the Organization of the Petroleum Exporting Countries, the holder of Africa's largest proved crude oil reserves, and an important contributor to the global supply of light, sweet crude oil. Libya joined the Organization of the Petroleum Exporting Countries (OPEC) in 1962, a year after Libya began exporting oil.1 Libya holds the largest amount of proved crude oil reserves in Africa, the fourth-largest amount of proved natural gas reserves on the continent, and it is an important contributor to the global supply of light, sweet (low sulfur) crude oil, which Libya mostly exports to European markets. Libya's hydrocarbon production and exports have been substantially affected by civil unrest over the past few years. 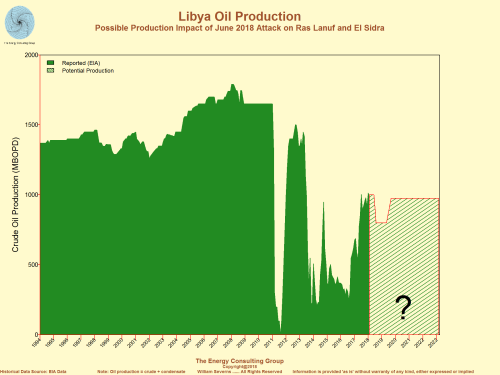 In 2011, Libya's hydrocarbon exports suffered a near-total disruption during the Libyan civil war, and the minimal and sporadic production that occurred was mostly consumed domestically. In response to the loss of Libya's oil supplies in the summer of 2011, the International Energy Agency (IEA) coordinated a release of 60 million barrels of oil from the emergency stocks of its member countries through the Libya Collective Action—the first such release since Hurricane Katrina in 2005. 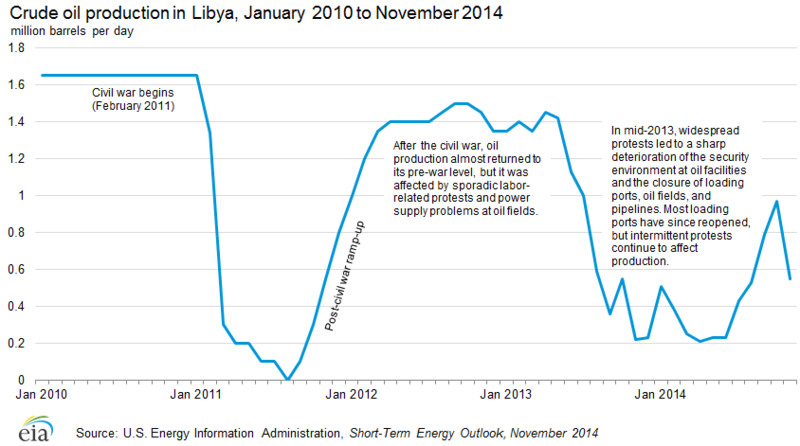 Libya's oil production recovered in 2012, but it still remained lower than levels prior to the civil war. In 2013 and 2014, Libya experienced major swings in its crude oil production, falling to its lowest level since the civil war of 0.2 million barrels per day (bbl/d) at the end of 2013. For almost a year, Libya's major eastern oil ports (Es Sidra, Ras Lanuf, Zueitina, and Marsa al-Hariga) were not able to export oil because of a blockade led by Ibrahim Jidran, a branch leader of the Petroleum Facilities Guard (PFG), which was hired to protect the facilities. The port blockades began in late-July 2013 and ended after deals were made to reopen the ports in April 2014 (Zueitina and Marsa al-Hariga) and June 2014 (Es Sidra and Ras Lanuf). 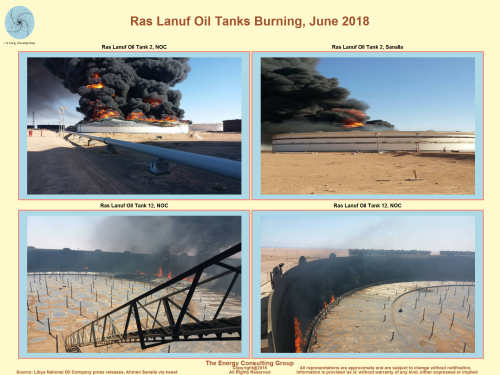 In the western part of Libya, production at the 340,000-bbl/d El Sharara field and, to a lesser extent, the 100,000-bbl/d El Feel field has also been repeatedly shut down. According to the Oil & Gas Journal (OGJ), Libya had proved crude oil reserves of 48 billion barrels as of January 2014—the largest endowment in Africa, accounting for 38% for the continent's total, and the ninth-largest amount globally.4 Libya has six large sedimentary basins—Sirte, Murzuk, Ghadames, Cyrenaica, Kufra, and the offshore, which the government believes has substantial undiscovered potential. 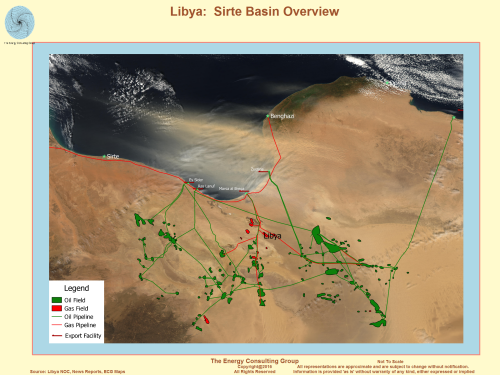 About 80% of Libya's recoverable reserves are located in the Sirte basin, which also accounts for most of the country's oil output.5 A majority of Libya remains unexplored, and ongoing civil unrest has prevented a large-scale exploration program. The country's National Oil Corporation (NOC) has emphasized the need to apply enhanced oil recovery techniques to increase crude oil production at maturing oil fields. Before the 2011 civil war, the NOC claimed that capacity additions of around 775,000 bbl/d were possible from existing oil fields. 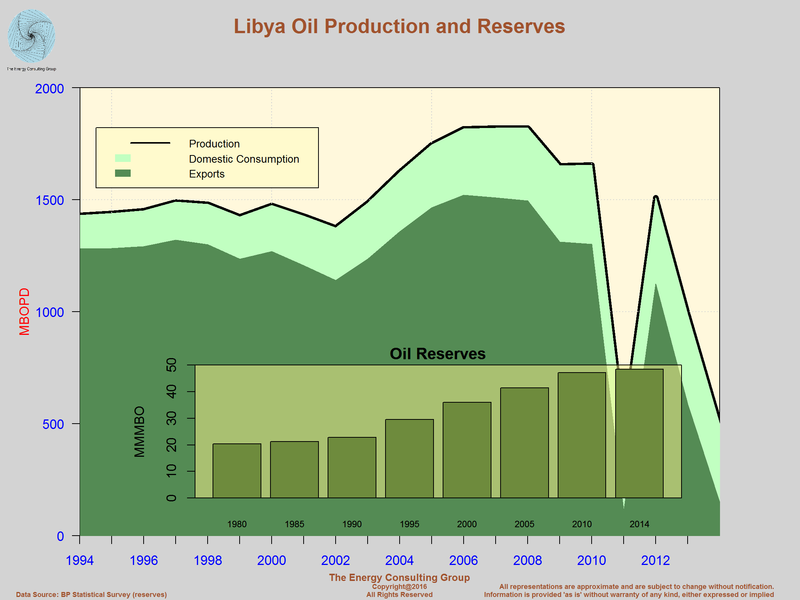 Before the 2013 oil sector crisis, the Libyan government had made several announcements of plans to increase crude oil production capacity to 1.7 million bbl/d by the end of 2013 and to 2 million bbl/d in the next few years.6 In the past, Libya's NOC emphasized investing in enhanced oil recovery (EOR) methods to counter depletion of reserves and to expand production capacity at existing fields. In 2009, the NOC announced a development program that entailed the development and rehabilitation of 24 oil and natural gas fields. The NOC's development program identified several oil-producing fields where capacity could be expanded. The largest capacity additions were planned for the Waha (Oasis) fields, the Nafoura/Augila complex, and the El Feel (Elephant) field. The program aimed to boost total capacity by 775,000 bbl/d from existing fields.7 Currently, plans to pursue any capital-intensive EOR projects in Libya have been postponed because of the political instability and volatile security environment. Prior to former Libyan leader Muammar Qadhafi's ouster, Libya's oil industry was run by the state-owned NOC. The NOC was responsible for implementing Exploration and Production Sharing Agreements (EPSA) with international oil companies (IOCs), as well as its own field development and downstream activities. Its subsidiaries include the Sirte Oil Company and the Arabian Gulf Oil Company (Agoco). The NOC continues to be the main body overseeing Libya's oil and natural gas industry. However, the situation recently became complicated as Libya currently has two competing parliaments vying for power—the elected and internationally recognized House of Representatives and the recently reinstated General National Congress (GNC). The GNC appointed a Ministry of Oil, although the ministry's role in the oil industry and the degree to which it is working with the NOC is still unclear. Even before the 2011 civil war, policy makers in Libya had been debating the content for a new hydrocarbon law. The last hydrocarbon law passed in 1955 is outdated and does not include much information on natural gas development and EOR projects. The proposed new law aims to establish a unified national law that encompasses all aspects of the hydrocarbon sector. After the 2011 civil war, there were a series of regulatory reviews pertaining to the structure and management of the hydrocarbon industry. The focus was on expanding the downstream sector, subsidy reform, restructuring of the NOC, and potential changes to upstream contracts and terms. However, it appears that formal discussions have been stalled because of the current unrest. IOCs, mainly from the United States and Europe, participate in Libya's hydrocarbon sector. IOC involvement in Libya experienced a resurgence in the mid-2000s as various rounds of sanctions were lifted by the United States and the United Nations (UN). Companies were lured by the country's bountiful resources, which outweighed regulatory uncertainties and the fact that contractual terms of the EPSA-IV (2005) licensing round were unfavorable to foreign investors. Now, IOCs are confronted with new types and unexpected degrees of political and security risks in Libya. In the short term, IOC involvement in Libya will depend on resolution of political issues, operational security, and new regulatory legislation that is enacted in the future. After Qadhafi's removal, Libyan officials have often attempted to reassure IOCs that they would honor the sanctity of existing contracts, while also reserving the right to review and revise those contracts that were secured through corrupt practices. 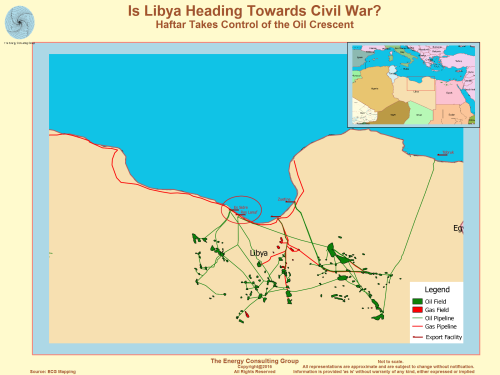 Libya's oil production was disrupted for most of 2011 because of the civil war, but it recovered relatively quickly following the cessation of most hostilities by the autumn of that year. The country's oil sector was crippled again in mid-2013 as widespread protests led to a sharp deterioration of the security environment at oil facilities and the closure of loading ports, oil fields, and pipelines. Most loading ports have since re-opened, but sporadic protests continue to affect oil production. Prior to the onset of hostilities in 2011, Libya had been producing an estimated 1.65 million bbl/d of mostly high-quality light, sweet crude oil. 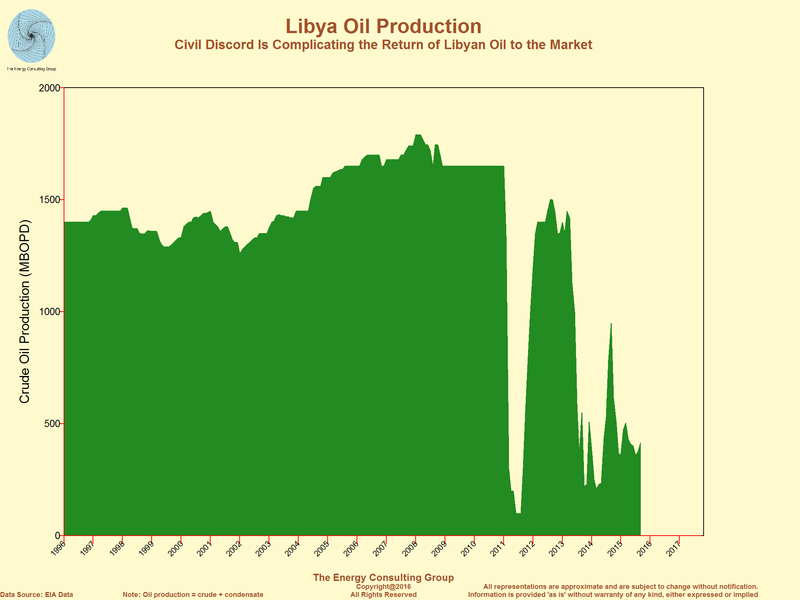 Libya's production had increased for most of the previous decade, from 1.4 million bbl/d in 2000 to 1.74 million bbl/d in 2008, but production remained well below peak levels of more than 3 million bbl/d achieved in the late 1960s. Oil production in Libya from the 1970s into the 2000s had been affected early on by the partial nationalization of the industry and later by sanctions imposed by the United States and the UN that impeded the investment and equipment needed to sustain oil production at higher levels. EIA estimates that Libya's current effective production capacity is slightly below 1.6 million bbl/d. Effective production capacity is defined as the amount of production that could come back to oil markets within a year. Effective production capacity takes into account a permanent or prolonged production loss due to the degradation of shut-in oil fields and damages to operational components that would take longer than a year to repair, which is dependent on the financial, security, and political situation. 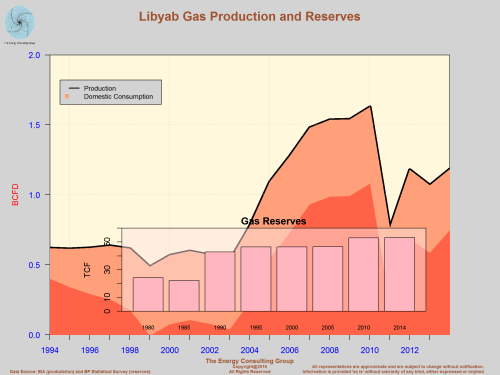 Some of Libya's production was compromised from the prolonged closure of oil fields during the 2011 conflict, but a vast majority of production was restored and restarted quicker than most industry analysts expected. Libya is currently going through another crisis that has crippled its oil sector. From January 2014 to November 2014, Libya's crude oil production averaged 450,000 bbl/d, nearly 500,000 bbl/d lower than the 2013 average and 900,000 bbl/d lower than the 2012 average. 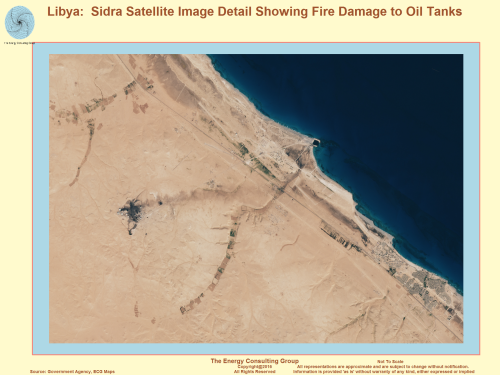 From mid-2013 to mid-2014, protests at major oil loading ports in the central and eastern regions of Libya forced the complete or partial shut-in of oil fields linked to the ports. Oil fields in the western part of the country were also closed intermittently during that time period because of protests at the field level or along the pipeline that transports the crude to the export terminals. At the time this report was written, Libya continues to experience sporadic protests throughout the country that are affecting production. Libya also produces an estimated 50,000 bbl/d to 100,000 bbl/d of non-crude liquids, which include condensate and natural gas plants liquids. These non-crude liquids typically come from the Mellitah gas processing plant, a gas processing plant at the Intisar complex, and a natural gas liquids plant in Marsa al-Brega. 1Oil from Nakhla (C97) is mixed with oil from Eni's Abu Attifel field. 2Most of the production from Agoco fields can be sent to Ras Lanuf and Marsa al Hariga (Tobruk). 3Oil from the Hamada field, which is located in the West, is sent to Zawiya. It is typically used domestically. 4Oil produced at NC74 is sent to Ras Lanuf. 5The Zueitina grade can also be sent to the Ras Lanuf terminal. 6Output from Lehib is mixed with output from one of Harouje's fields and sent to Ras Lanuf. 7Bouri and Farwah (Al-Jurf) are offshore loading platforms of Mellitah. Libya typically exports most of its crude oil (70% to 80%) to European countries, with Italy being the leading recipient. The United States resumed importing crude oil from Libya in 2004 after sanctions were removed, although the amount imported typically is small. In 2013, Libya exported an average of 875,000 bbl/d of crude oil, including condensate, which is lower than the 2012 level of almost 1.3 million bbl/d but higher than the 2011 level of 400,000 bbl/d during the civil war.8 In 2013, Libya's exports were curtailed because of disruptions to oil production that escalated in mid-2013 and continued into 2014. Typically, most (70% to 80%) of Libya's crude oil is sold to European countries. In 2013, about 75% of Libya's crude exports were sent to Europe; the leading single recipients were Italy, Germany, and France. The United States restarted oil imports from Libya in 2004, after sanctions were lifted. The United States imported 43,000 bbl/d of crude oil from Libya in 2013, representing only about 0.6% of total U.S. imports during that year. Libya consumed an average of 248,000 bbl/d of petroleum and other liquids in 2013. Most of Libya's oil consumption comes from its domestic refineries. 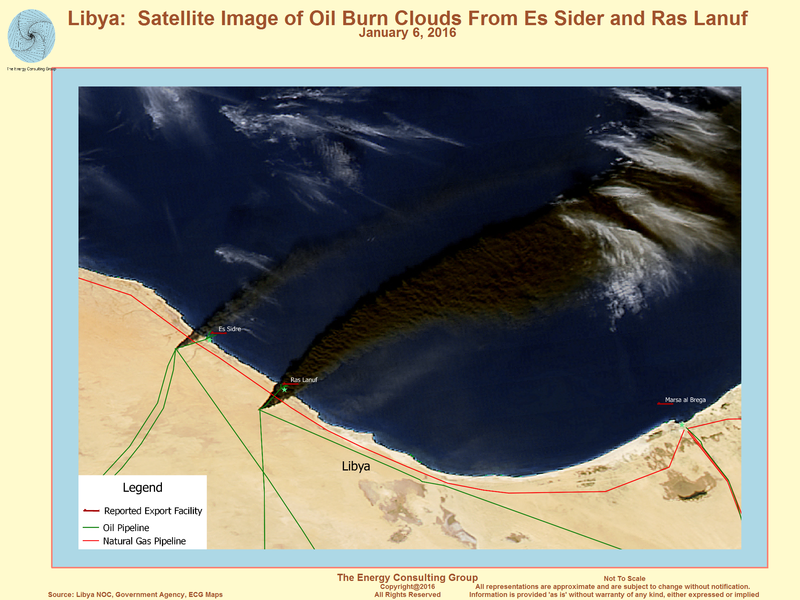 According to OGJ, Libya has five domestic refineries with a combined crude oil distillation capacity of 378,000 bbl/d.9 Libya's NOC has periodically released plans to expand the downstream sector and upgrade its existing refineries, but ongoing unrest over the past few years has prevented any large-scale new investments. 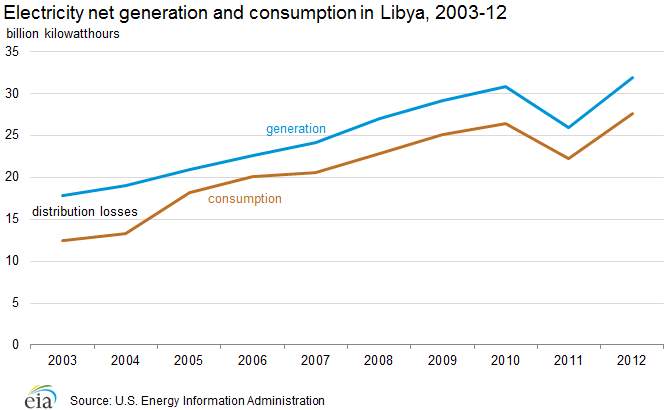 As with its oil sector, Libya's natural gas industry recovered in 2012, but production still remained below the pre-war level. 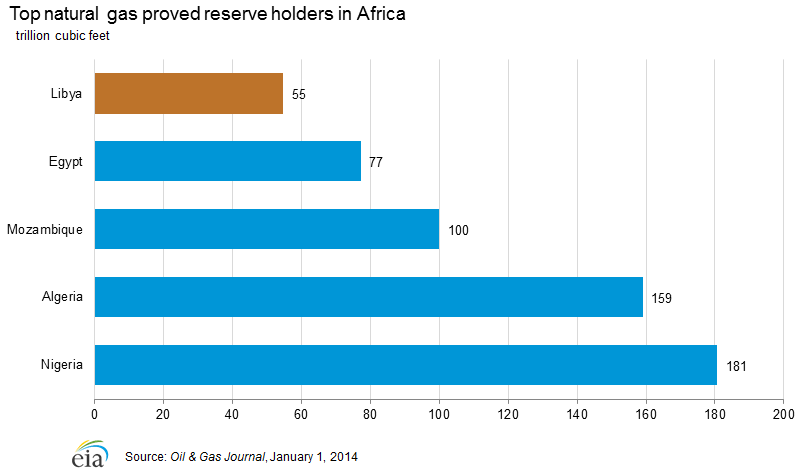 Libya's rank as a producer and reserve holder is less significant for natural gas than it is for oil. 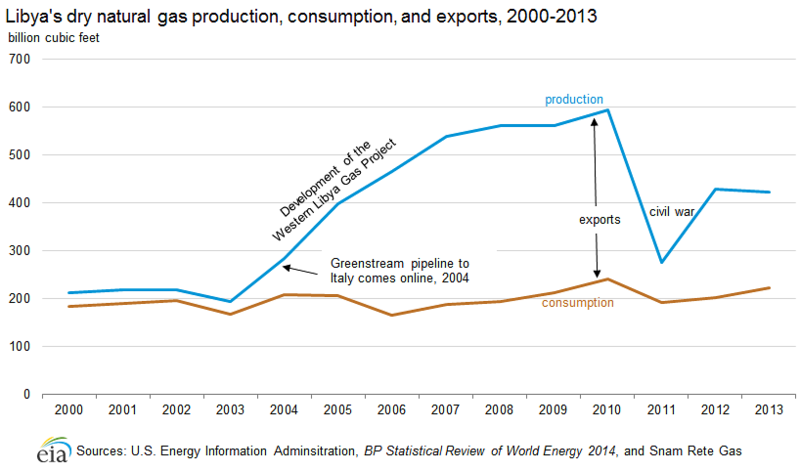 About half of its natural gas production is exported to Italy via the Greenstream pipeline. As of January 1, 2014, OGJ estimated that Libya's proved natural gas reserves were almost 55 trillion cubic feet, making it the fifth-largest natural gas reserve holder in Africa.10 Prior to the transformative events of 2011, new discoveries and investments in natural gas exploration had been expected to raise Libya's proved reserves in the near term. Many of the same entities involved in oversight and operations of the oil industry exercise similar functions for natural gas. Likewise, some of the same questions and uncertainties about the future are equally applicable to both sectors. 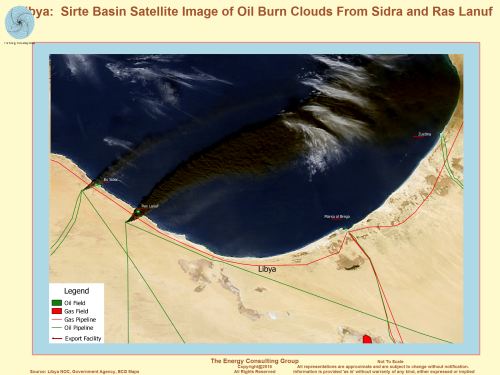 Libya's natural gas sector is mostly state-run by the NOC and its Sirte Oil Company subsidiary. IOCs are less involved in natural gas production than they are in oil production, although Eni is a notable exception because of its stake in the large Western Libya Gas Project. Libya's natural gas production and exports increased considerably after 2003 with the development of the Western Libya Gas Project and with the opening of the Greenstream pipeline to Italy. Italy is currently the sole recipient of Libya's natural gas exports. Libya's dry natural gas production grew substantially from 194 billion cubic feet (Bcf) in 2003 to 594 Bcf in 2010. The Western Libya Gas Project (WLGP), which is operated by Eni and NOC through the Mellitah Oil & Gas joint venture, accounted for most of Libya's natural gas production growth after 2003. The WLGP includes the onshore Wafa and offshore Bahr Essalam fields. Typically, most of the gas produced from WLGP is exported via the Greenstream pipeline and the remainder is consumed domestically. Most other natural gas output in Libya is produced by the NOC and its Sirte Oil Company subsidiary in the onshore Sirte Basin and is associated with oil production. The NOC has announced plans to increase the country's natural gas production from offshore and onshore fields. New or expanded projects to support this goal include associated oil and natural gas fields in various stages of development, most notably Faregh, operated by Waha in the Sirte Basin, and Mellitah's offshore Bouri field. The NOC also says it intends to use the natural gas that is currently being flared. Increased production of marketed natural gas would most likely result in a greater use of natural gas in the power sector and free up more oil for export. However, like all prospective oil and gas plans in Libya, greater development of the natural gas sector is contingent on support and certainty of political institutions and the security environment. In 1971, Libya became the third country in the world, after Algeria and the United States (Alaska), to begin exporting liquefied natural gas (LNG). In the past, the country exported a small amount of LNG to Spain. However, the LNG plant was damaged during the 2011 civil war, and Libya has not exported LNG since early 2011. In 2013, Libya consumed about 223 Bcf of dry natural gas, or slightly more than half of what the country produced. Libya exported the surplus of its production (200 Bcf in 2013) to Italy via the Greenstream pipeline.12 Natural gas production and exports have partially recovered since the 2011 civil war but still remain lower than pre-war levels. In 2011, natural gas exports dropped to 85 Bcf, about 75% lower than the previous year. 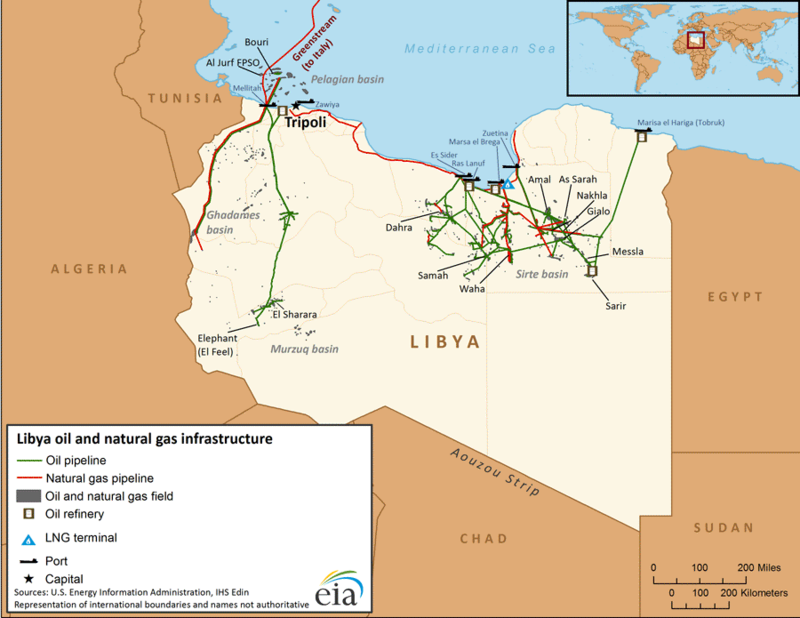 Prior to the 2011 civil war, Libya exported natural gas via pipeline to Italy and in the form of LNG to Spain. However, Libya's LNG plant was severely damaged during the 2011 civil war, and Libya has not exported LNG since early 2011. Natural gas exports via the Greenstream pipeline were completely suspended for nearly eight months from March 2011 to mid-October 2011 because of the civil war. Exports partially recovered to 228 Bcf in 2012, albeit lower than the 2010 level of 344 Bcf. Electricity generation has more than doubled from 2000 to 2010. Despite growth in electricity generation and a high electrification rate, the country suffers from regular power outages. Libya's oil sector has also been affected by power supply issues, which have compromised production at some of the country's largest oil fields. According to the latest 2012 estimate from the International Energy Agency, 99% of Libyans living in rural areas and all Libyans living in urban areas had access to electricity, which are some of the highest electrification rates among African countries. Despite these high rates, the country suffers from power outages caused by electricity shortfalls and frequent disruptions to oil and natural gas production. In addition to end users being affected by outages, power shortfalls have also affected production at some of Libya's largest oil fields, including fields operated by Agoco and Mellitah. Installed electricity generation capacity has grown by 50%, from 4.7 gigawatts in 2002 to 7.1 gigawatts in 2012. Electricity generation has grown at a faster rate than capacity, more than doubling from 2000 to 2010. The growth in electricity generation reflects higher economic growth and greater investment in the oil and natural gas sectors, particularly after sanctions were lifted. In 2011, electricity generation fell by 16% from the previous year because domestic oil and natural gas production was heavily disrupted during the civil war, but recovered in 2012 to 32 billion kilowatthours. 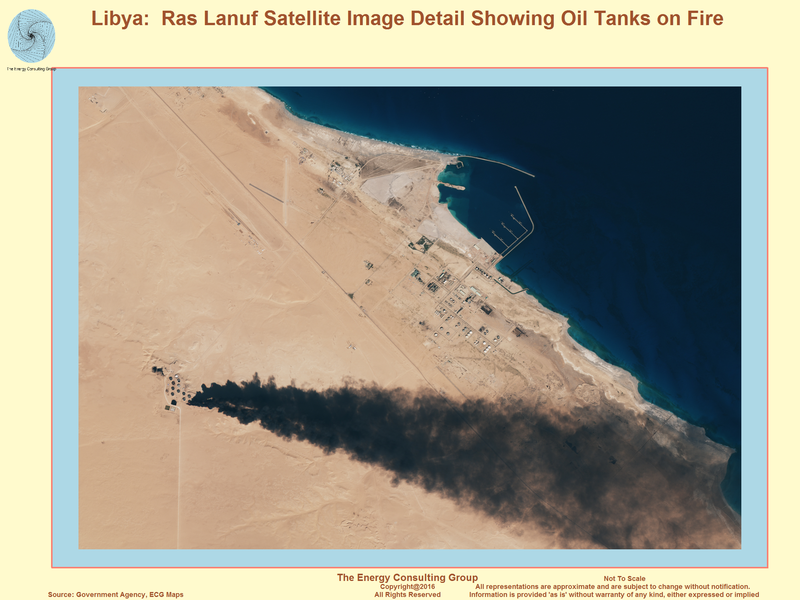 Libya's power plants are fueled entirely by oil and natural gas. Data presented in the text are the most recent available as of November 25, 2014. 2International Monetary Fund, Libya country report (May 2013), page 22-23. 3International Monetary Fund, "Arab Countries in Transition: Economic Outlook and Key Challenges" (October 9, 2014), page 13. 4Oil & Gas Journal, "Worldwide Look at Reserves and Production," (January 1, 2014). 5Arab Oil & Gas Directory, www.stratener.com, "Libya" (2013), page 256. 6Middle East Economic Survey, "Libya: Light At End Of Tunnel As Losses Hit $7.5bn," (September 20, 2013), Volume 56, Issue 38. 7Arab Oil & Gas Directory, www.stratener.com, "Libya" (2013), page 257-8. 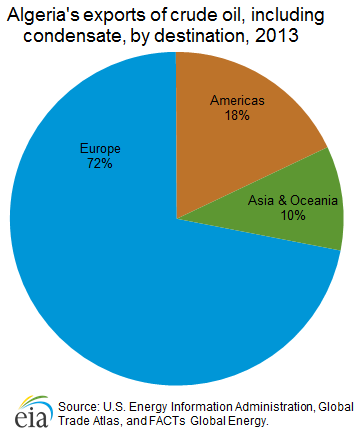 9Oil & Gas Journal, "Worldwide Refining," (January 1, 2014). 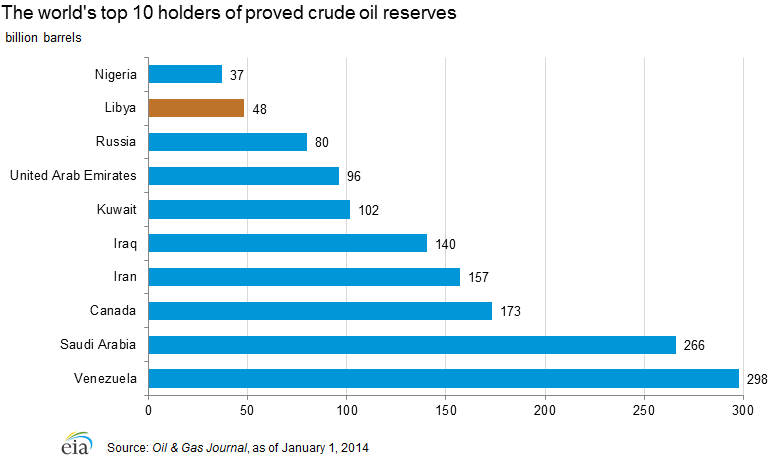 10Oil & Gas Journal, "Worldwide Look at Reserves and Production," (January 1, 2014). 11BP, "Statistical Review of World Energy June 2014," http://www.bp.com/en/global/corporate/about-bp/energy-economics/statistical-review-of-world-energy.html. 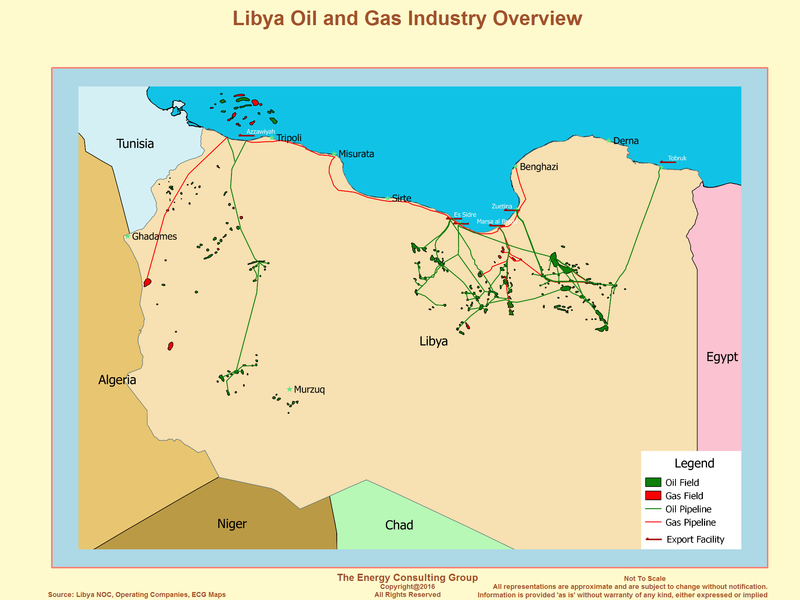 13Energy Intelligence Group, World Gas Intelligence, "Libya Halts Italy Flows," (October 8, 2014). 14Arab Oil & Gas Directory, www.stratener.com, "Libya" (2013), page 267-8.